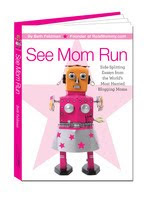 What struck me most about See Mom Run were the confessions in a majority of the essays about a previous resolve that went by the wayside when reality set in. We all hope to avoid becoming one of those mothers - whatever stereotype we're trying to avoid. So here are my confessions of being one of those mothers. I am one of those mothers that will put my child's hair in a ponytail to hide the tangles. I am one of those mothers that put a TV in my girls' room because I couldn't stand to listen to Spongebob one.more.time. I am one of those mothers that didn't attend Sylvia's Back-to-School Night because I forgot that it was that night. I am one of those mothers that doesn't really enjoy playing games with my girls. They get way too competitive and fun soon turns to fight. I am one of those mothers that let my middle schooler have a cell phone. I am one of those mothers that yells at my girls sometimes. I've gotten better about this in the past year, but it happens. All I can do is what I can do. I am one of those mothers that enjoys feeling superior to the families that appear on SuperNanny. I am one of those mothers that will let the girls stay up past their bedtime so we can all watch Glee together. I am one of those mothers that doesn't keep a spotless home. I am one of those mothers that believes in picking my battles. I'll change the rules on the girls when I feel like something has to change. I'll let the girls watch SpongeBob in their room so I can finally get the living room back in order or do some laundry. Or watch a grown-up show with a glass of wine. I am frighteningly aware of all the girls' imperfections, and my own. I am also aware that our time together is getting shorter and shorter. So sometimes I'll choose instead to just cuddle with them. To allow for singing and dancing around the house. I'll endure sibling rivalry because I know in the end, these girls will be each other's best friends for life, and they'll grow out of it. And I'll have too many hours to myself to clean the house without interruption in just a few short years. In spite of all our imperfections, I'm one of those mothers that loves my girls unconditionally, and they know that in their hearts. *This post is part of SV Moms book club. See, I think all of those things are what makes you a good mother-and I am aware that maybe I think that just so I can justify my own incidences of being one of those mothers, ha ha. You are one of those mothers that other moms look up to, and that's saying something. Whatever you don't do with the girls, you more than make up for it with what you do DO. Ha, I said do do. Seems I am one of those mothers too, because I have done every single one of those things on your list! Let's face it, I am TIRED. Thanks for making what I thought were my imperfections seem admirable! I totally laughed out loud at the Supernanny one - that is EXACTLY why I watch that show. Just when I think my kid is the worst I think well at least I don't have THAT kid! I yell too much, I give in when I know I should stand my ground because I just tired of fighting, I don't mind playing board games but don't ask me to play pretend with barbies. I guess I'm one of those moms too. I let my kid have a TV in his room because I didn't want to watch him play 'Need for Speed' and I yell, don't have a spotless house and pick battles. Maybe it's the uber mommies who are the minority and who should try to be more like us. I agree with Kori. I think that just by knowing that you're not perfect, you show more care for your children. Mothers who think they are actually perfect? Delusional! No one is. I let my kid watch WAY too much TV and sometimes when I'm just too tired, I let him get away with stuff I shouldn't. Whatever. He's happy, and he's a lovely kid. We are just being our natural selves when we do the things in your list, and I think that makes us better mothers. Perfect moms must spend all their time planning and guiding and no being real. I love confession posts! It always helps to know that a fellow mom loses her marbles sometimes, too :) Cheers to accepting our flawed, but awesome selves! OMG, you're one of THOSE mothers? Well, I'm not going to read your blog anymore then! Oh, so you're one of THOSE moms? One of THOSE moms who dares do what she thinks is best for the girls she knows better than anyone else in the world? You're an amazing mom. Your girls are so lucky to have a mom who knows what's REALLY important. Nothing wrong with being one of "us" mothers :). So THAT's what I need to do with Spongebob! I love my daughter and can't wait to have one more. Although it's work and there are so many long days ahead of me, it will be dfficult once they leave the nest. Kuddos to you for enjoying every minute and understanding when you don't know it all. Love the honesty and the realness—I'm one of those dads that let his kids watch R rated inappropriate movies, from horror to "The Hangover." Hey, you can only watch so many insipid family movies before neurons start to severely atrophy. I'm one of those mothers that wakes up late and then gets annoyed at my daughter because she's not getting ready quickly enough. Plus most of the stuff on your list too. Well, we never claimed to be perfect.